A busting south-wester this weekend produced some heavy seas and resulted in some great waves. An advertorial published by the eThekwini Municipality in The Mercury and The Witness today 18th August confirms sewage spill under control. Read the Mercury article here. 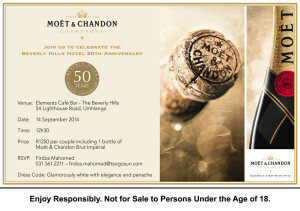 Join The Beverley Hills as they celebrate their 50th anniversary with Moet and Chandon at a glamourous luncheon on 14th September. Read event details here.